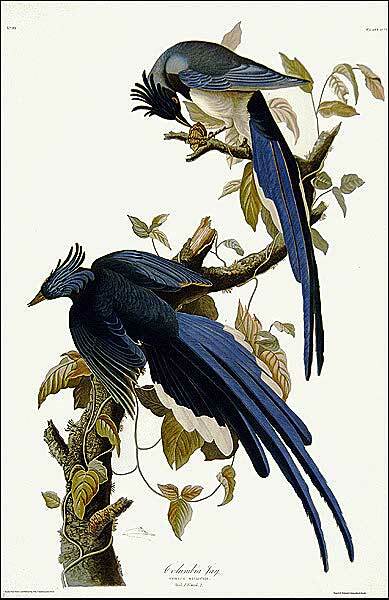 John James Audubon (1785-1851) was born in Haiti, the son of a chambermaid and a French sea captain. Educated in France, he moved to the USA in 1803 in order to avoid conscription in Napoleon’s army. 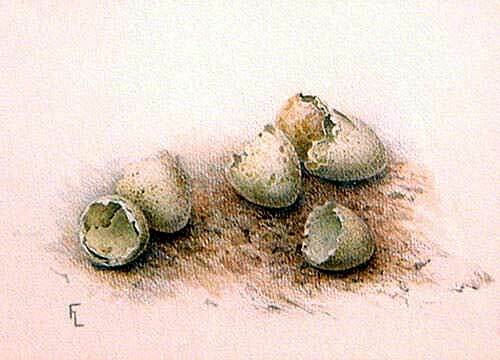 Living as a naturalist, hunter and birder he made small coin as a portraitist and art teacher. Several attempts at commerce failed. 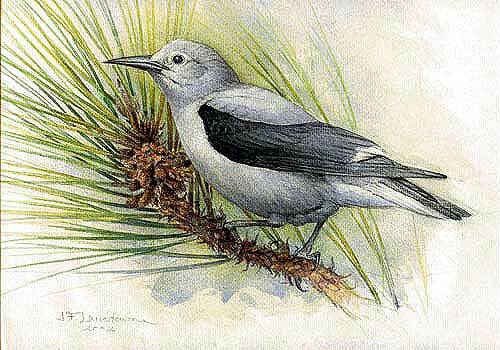 Along the way he devised a plan to paint a complete record of the birds of North America. 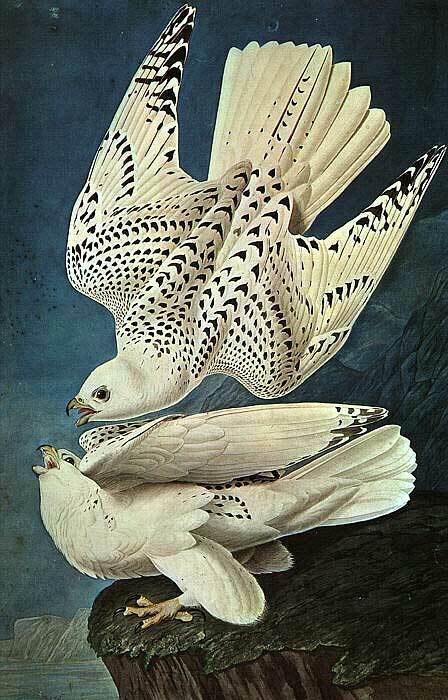 Unable to find a local publisher, Audubon went to England in 1826 and linked up with an engraver named Robert Havell. 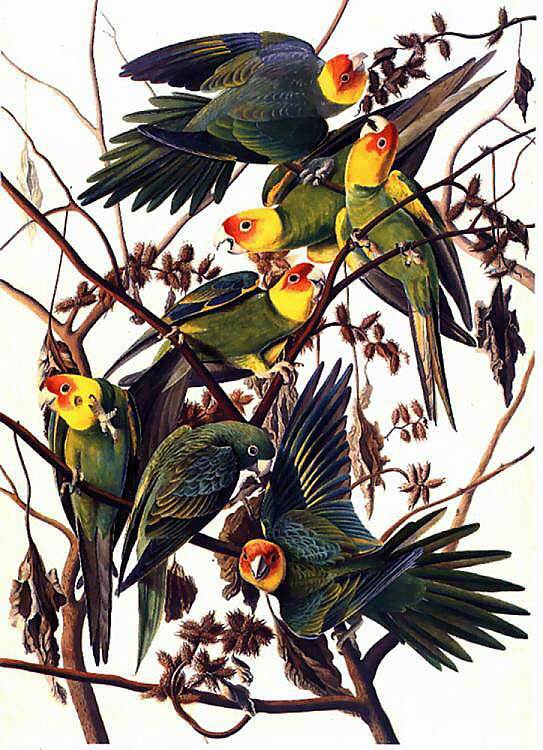 The result was the publication of The Birds of America, four volumes of 435 hand-tinted aquatints. These folios are now among the most famous and prized books in the world. Audubon was a boastful, obstreperous fellow. With his long, bear-greased hair, black frock coat and pantaloons, he cut an odd figure. He remained focused on his project for more than twenty years. 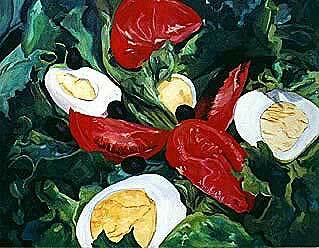 When he was on a roll he employed assistants to paint leafy bracts and backgrounds. 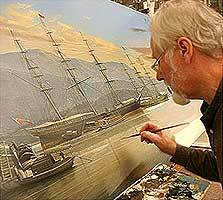 He worked in watercolour, pastel, collage, graphite and oil — sometimes all in one painting. Birds were shot and wired up in lifelike poses. Museums cooperated by supplying the skins of birds he could not find in life. Finding subscribers was often his main job. He signed up the nobility and gentry on both sides of the Atlantic. Monthly or yearly payments were made in exchange for serial deliveries — five prints at a time, flat in a tin box. 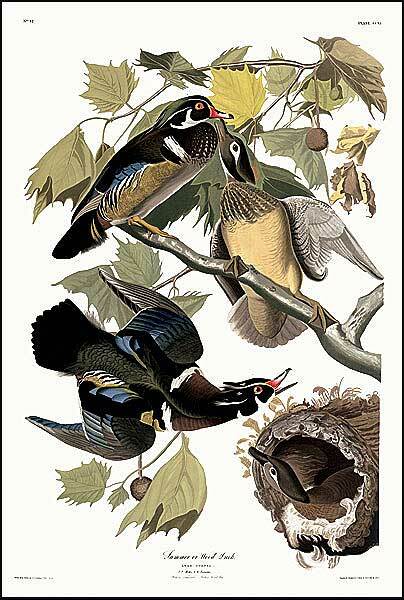 By the time Audubon completed the set many of his subscribers were dead or had lost interest. There were perhaps about 160 of the edition completed. Audubon died at 66, probably of Alzheimer’s. Lucy, his widow, sold some of the copper plates for scrap, and died poor. Esoterica: The public was struck by the complex and graphic drama in many of Audubon’s paintings. Some, such as Wood Duck and Carolina Parakeet are hard to beat by even the top bird painters working today. On a snowy morning like this in Oklahoma, I find imagining you at the Audubon House on Key West quite exciting and well, warming. I am a junior high art teacher as well as a watercolor artist and have always found Audubon’s work and life fascinating. I base a painting and paper mache unit with the 7th grade on Audubon’s work. I will now incorporate your letter into the curriculum, if you don’t mind. I have a chance to write you today because we have a “snow day”. It’s 17 degrees Fahrenheit outside and the roads are covered with a sheet of ice. However, I will spend the day painting Macaws in the Rain Forest. 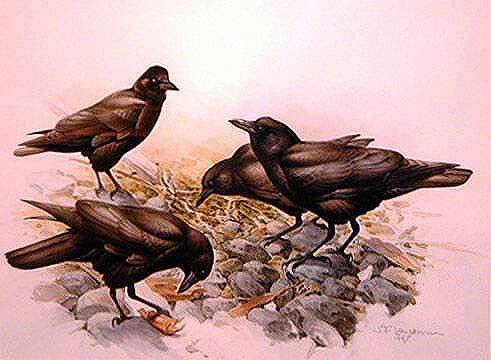 No wonder that Audubon died of Alzheimer’s — 435 aquatints — what a very toxic load to put on one’s body! 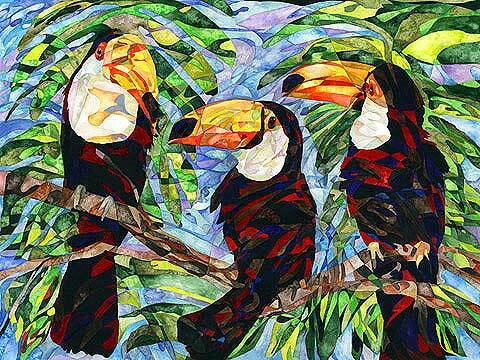 His art is truly a wonder, and his birds are a legacy for generations yet to come. Still I am so glad that today we can do relatively non-toxic etching with ImageOn and other light-sensitive polymers, and substitutes for aquatint, the process that gives such wonderful effects but has killed so many artists. Regarding your love of birds, a place to visit in Florida is Darling’s Preserve on Sanibel Island. It has gorgeous scenery and lots and lots of birds, crocs, sunbathing close to the trails, etc. Biking is allowed along the hiking paths and it is a great place to visit. Doesn’t Florida have the most wonderful collection of strange birds and animals? I love the little birds they called “Florida Chickens.” I think they are a type of egret. My daughter lives near Fort Meyer and they have them in their yard. They do, indeed, look like chickens in the barnyard, heads down, feeding their way across the grass. (RG note) Once a rarity in Florida, the Cattle Egret has become a very successful bird. It knows how to cooperate with humans and other animals. Regarding your last letter from Key West, I often have a flock of ibis in my front yard. We live near Sanibel Island which is home to many wildlife enthusiasts, and includes Ding Darling Sanctuaries. He was also a wildlife artist. The neighboring island of Captiva is the home of Robert Rauschenberg. 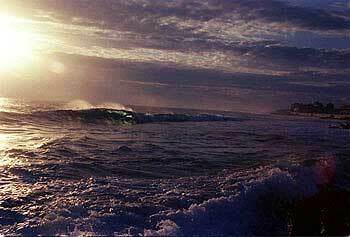 Both islands are well worth visiting as they are a source of inspiration for artists. Should you or any subscriber ever pay a visit there, I would be delighted to meet with them. I am a member of the Sanibel-Captiva Art League. (RG note) Thanks, Pat — and thanks to everyone who offered a visit. That letter ended badly! Poor widow… and I was so enjoying learning about the bird painter. I spent my day doing some bas relief (pollyfilla cellulose filler on watercolour paper) with 120 kids in grade 3 and 5, back tomorrow to paint them… and this is not Florida, it is frigid Nova Scotia! Kids so enjoy the creativity and we are so fortunate to have a great art program in our community and many volunteers — I think the adults that come to help out crave the creativity too! One little boy said “I want to be an artist when I grow up” well you don’t hear that too often these days, especially from a 9 year old. Hope he is wise and stocks away some savings so he doesn’t leave a Lucy (or end up like one)! Please start writing happy endings to all my favorite and highly-held mentors’ lives. I’ve never had the pleasure of meeting Mr. Audubon, but I’m sorry for he and his wife’s terrible fate. I can hardly believe how tough it is to put money away for the later years, even when you’re freakin’ J J Audubon for crying out loud! I keep thinking our generation of artists will reverse that trend, and you won’t have to fabricate happy endings for the likes of us. But sometimes we’re soooo absorbed in the process of creating that we forgo the seemingly unimportant “stuff”, like saving. Just tonight, I had to be reminded that going to a mall show in Iowa might be a tad risky, with freezing rain and sleet being called for on Sunday. My wife had to take the brush out of my hand, turn my chair around to face her, identify herself to me (in case I was still comatose at the easel) and let me know about the weather. She spoke slowly and succinctly: “Painting stop — no road show – – no hotel — no road — no Starbucks.” I think it was the Starbucks thing that brought me out of it. Please change Audubon’s bio to read something like “He died blissfully in the arms of his beloved, and Mrs A cried a little every time she had to make a withdrawal at the bank.” Say something like, “She lived on and well, until her death, leaving tons of money to an art school and its continuing scholarships that survive to this day.” The truth, although valuable and a learned commodity, hurts an awful lot when it comes to our heroes. (RG note) An artist’s cash flow can be sporadic. For many, even the highly successful, it can be feast or famine. Long ago I devised a simple plan to “pay myself first” — no matter what my monthly income I save a percentage or invest it. Audubon failed to do this. He was always betting the full poke on the next roll. When poor health overtook him he was caught short and his family suffered. Interesting that I should come to the end of the previous clickbacks and there is a Fenwick Lansdowne. You can see the actual observation that went into the work while those Audubon poses look “wired.” I enjoy Lansdowne’s books as much for the preliminary drawings and his comments as for the completed works. In the meantime, I am envying your sighting of not one but five Roseate Spoonbills! (RG note) Fen and I have been friends since our early teens. He is one of the most natural and anatomically correct bird artists around. Someday I’ll do a letter on him. I guess I’m doing some mixed media (or perhaps, mixed-up media) as I’m taking digital photographs, mucking around in Photoshop, printing out transparencies and printing on metal solarplate in the sun. Does that count as digital art? Art is a means of expression — art that can be fabricated by those with a desire and the training. One must learn how to use tools such as Photoshop to create, similar to learning how to use a manual camera. Next add some basic darkroom technique so as to understand what burn (darken) and dodge (lighten) mean. So a creating you will go… except that to be truly good at your craft you must begin to understand how the concepts of design coexist with technological knowledge. As in all art and craft it’s all about how you look at it. “The Wizard,” that you mention in your letter, in the digital world is but a guide who leaves us with a handful of balloons and no idea how we got them. 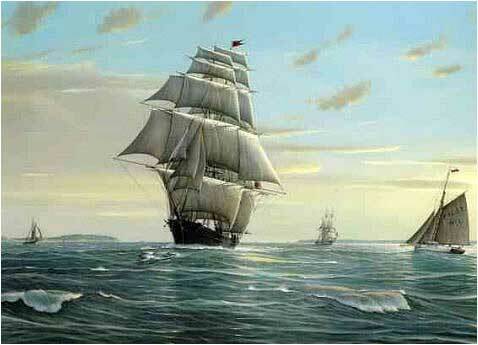 I read the responses to the at-sea art auctions, and recalled my only experience, a positive one, with art auctions. They were auctioning Miro, Matisse and Picasso prints, but they also made space for local artists. It was in Kodiak, Alaska, not exactly a center of international commerce, but well over a dozen local artists were represented. I sold more work at that one auction, in three hours, than through any other sales device, except word of mouth and commissions, in my entire career. My sales that night literally bumped me up into a higher tax bracket that year. I have sold many commissions over the years and the occasional painting through a gallery or commercial placement, but never the sheer volume of that one event. It took another year to work off the commissions that one bit of exposure created. I look at it this way: people attend an auction primed to buy art, with money in their pocket. They are looking for a ‘deal,’ hoping to ‘discover’ an artist, make an ‘investment.’ Whether or not any of these expectations are realistic, as an artist your work is in a room full of people primed to buy your work, on the spot, and the auction atmosphere has a lot to do with it. I’m a graphic artist, making digital collages with old postcards in the public domain. I am trying to research the copyright on three illustrators from the 19th century: Mary Horsfall (Great Britain), Giovanni Guerzoni (Italy), and Olga Riesen (Germany). I have done a ton of research on the Internet (Union List of Artist Names at getty.edu, the Artist’s Rights Society, Bridgman, and a catalog of 10,000 postcard artists.) 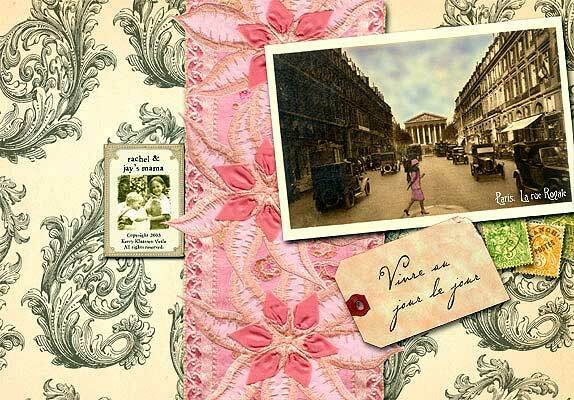 A company now wants to publish my collages using these postcard images, but I’m not sure of the copyrights on the images. We don’t want to lose the house over a couple hundred dollars’ sale of art work! To determine the copyright duration on the above artists, we need to know the date they died. Do you have any thoughts, or perhaps could you see if your readership has any ideas? (Andrew Niculescu note) See Lolly Gasaway, University of North Carolina: It seems that when you have looked hard and not found, this is sufficient permission to go ahead. There are no references to those artists anywhere on the Internet — as you have found. When there is no evidence of copyright there are no definite guidelines and the best you could do is have proof that you tried to honour any existing copyrights. Keep a record of your research. You may be interested to know that artists from every state in the USA, every province in Canada, and at least 89 countries worldwide have visited these pages since January 1, 2004.